Mr. Wikipedia says that the term "wedding soup" is a mistranslation of the Italian language phrase "minestra maritata ("married soup")," which is a reference to the fact that green vegetables and meats go well together. But mistranslation aside, Italian wedding soup is one of my favorite dishes. Not only that the soup is full of healthy ingredients, it is easy to make and it's darn tasty. 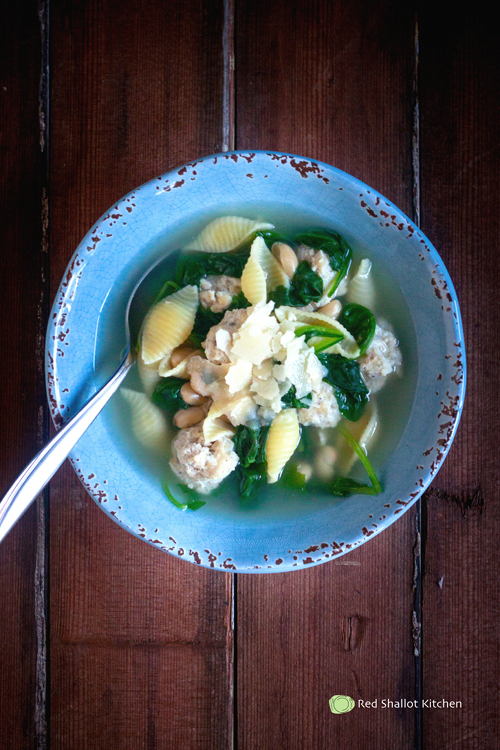 There are many many versions of this soup, but 2 things don't change; meatballs and greens. In this version, I use turkey meatballs but feel free to use any kind of meat. Same goes with the greens. Spinach, escarole, kale, swiss chard, any kind of green vegetable will work beautifully. Since I honestly hate making meatballs, I always try to double or triple the batch and keep the unused meatballs in the freezer. They come in handy whenever I need them. In a large bowl, mix turkey, egg, bread crumbs, cheese, onion powder, garlic powder, oregano, salt and pepper until well combined. Roll meat mixture into 1-inch balls, place them on a lined baking sheet (you should have about 30-35 meatballs), bake for 30 minutes or until the meatballs are cooked through and lightly browned. Set aside. In a soup pot, heat the oil over medium-high heat. Add onion and garlic, sauté until soft. Add chicken stock into the pot, bring to boil. Add beans and dry pasta into the boiling stock, cook for 5-6 minutes until the pasta is almost tender. Add meatballs, season the soup with salt and pepper, simmer for 1 minute. Stir-in the spinach, cook until just wilted, about 1 minute. Ladle soup into individual bowls, sprinkle with parmesan cheese, and serve immediately. Now,you can watch Fussball em 2016 live stream. Now,you can share father's day quotes, greetings and messages. Hellow,You can watch Tour De France 2016 live streaming. Amezing Hindi status Share with your freinds. You can Download Latest application for PC and Android. You can share Latest One line Status and Religious status in Hindi for Whatsapp. This is some kind of soup I may want to try not only on my wedding day but for some dinner party. It looks good and I have already downloaded the recipe, I just hope that I may find all the ingredients needed and may be able to cook it according to the recipe. The Christmas 2016 we have included Merry Christmas Images, Merry Christmas Greetings, Christmas SMS. Punjab Education Board will be going to issues out PSEB 10th Result 2017 in the month of May, 2017 for all of you. Check & Download PSEB 12th Result once announced. So Holi is the festival of sharing love. Some people share their love in this day with different styles. Some people greet their relatives and friends by sending the message. Here brings a lot of HOLI IMAGES DOWNLOAD Holi hd wallpapers Holi Images For Facebook thank you so much. Dallas St. Patrick’s Parade & Festival Saturday, March 11, 2017.
high and placed me on the top of the wall.